Hamidi, �., Sadjadi, S., Bonyadi Naeinib, A., Moosavi Tabatabaeia, S. (2017). An integrated production-marketing planning model With Cubic production cost function and imperfect production process. 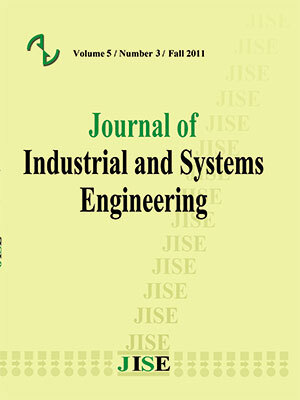 Journal of Industrial and Systems Engineering, 10(special issue on production and inventory), 91-108. َAghil Hamidi; Seyed Jafar Sadjadi; Ali Bonyadi Naeinib; Seyed Reza Moosavi Tabatabaeia. "An integrated production-marketing planning model With Cubic production cost function and imperfect production process". Journal of Industrial and Systems Engineering, 10, special issue on production and inventory, 2017, 91-108. Hamidi, �., Sadjadi, S., Bonyadi Naeinib, A., Moosavi Tabatabaeia, S. (2017). 'An integrated production-marketing planning model With Cubic production cost function and imperfect production process', Journal of Industrial and Systems Engineering, 10(special issue on production and inventory), pp. 91-108. Hamidi, �., Sadjadi, S., Bonyadi Naeinib, A., Moosavi Tabatabaeia, S. An integrated production-marketing planning model With Cubic production cost function and imperfect production process. Journal of Industrial and Systems Engineering, 2017; 10(special issue on production and inventory): 91-108. The basic assumption in the traditional inventory model is that all outputs are perfect items. However, this assumption is too simplistic in the most real-life situations due to a natural phenomenon in a production process. From this it is deduced that the system produces non-perfects items which can be classified into four groups of perfect, imperfect, reworkable defective and non-reworkable defective items. In this paper, compared with classic model, a new integrated imperfect quality economic production quantity problem is proposed where demand can be determined as a power function of selling price, advertising intensity, and customer services volume. Furthermore, as novelty way the unit cost is defined as a cubic function of outputs which is similar to real world. Also, a geometric programming modeling procedure is employed to formulate the problem. Finally, a numerical example is illustrated to study and analysis the behavior and application of the model. Abuo-El-Ata, M., Fergany, H. A., & El-Wakeel, M. F. (2003). Probabilistic multi-item inventory model with varying order cost under two restrictions: a geometric programming approach. International Journal of Production Economics, 83(3), 223-231. Baker, R., & Urban, T. L. (1988). A deterministic inventory system with an inventory-level-dependent demand rate. Journal of the operational Research Society, 823-831. Beightler, C. S., & Phillips, D. T. (1976). Applied geometric programming (Vol. 150): Wiley New York. Boyd, S., Kim, S.-J., Vandenberghe, L., & Hassibi, A. (2007). A tutorial on geometric programming. Optimization and engineering, 8(1), 67-127. Brown, R. M., Conine, T. E., & Tamarkin, M. (1986). a note on holding costs and lot-size errors. Decision Sciences, 17(4), 603-610. Cárdenas-Barrón, L. E. (2008). Optimal manufacturing batch size with rework in a single-stage production system–A simple derivation. Computers & Industrial Engineering, 55(4), 758-765. Chan, W., Ibrahim, R., & Lochert, P. (2003). A new EPQ model: integrating lower pricing, rework and reject situations. Production Planning & Control, 14(7), 588-595. Chen, C.-K. (2000). Optimal determination of quality level, selling quantity and purchasing price for intermediate firms. Production Planning & Control, 11(7), 706-712. Cheng, T. (1989). An economic order quantity model with demand-dependent unit cost. European Journal of Operational Research, 40(2), 252-256. Chiang, M. (2005). Geometric programming for communication systems: Now Publishers Inc.
Duffin, R. J., Peterson, E. L., & Zener, C. (1967). Geometric programming: theory and application: Wiley New York. Fathian, M., Sadjadi, S. J., & Sajadi, S. (2009). Optimal pricing model for electronic products. Computers & Industrial Engineering, 56(1), 255-259. Groenevelt, H., Pintelon, L., & Seidmann, A. (1992). Production lot sizing with machine breakdowns. Management Science, 38(1), 104-123. Gujarati, D. N. (2003). Basic Econometrics. 4th: New York: McGraw-Hill. Hayek, P. A., & Salameh, M. K. (2001). Production lot sizing with the reworking of imperfect quality items produced. Production Planning & Control, 12(6), 584-590. Islam, S. (2008). Multi-objective marketing planning inventory model: A geometric programming approach. Applied Mathematics and Computation, 205(1), 238-246. Jamal, A., Sarker, B. R., & Mondal, S. (2004). Optimal manufacturing batch size with rework process at a single-stage production system. Computers & Industrial Engineering, 47(1), 77-89. Jung, H., & Klein, C. M. (2001). Optimal inventory policies under decreasing cost functions via geometric programming. European Journal of Operational Research, 132(3), 628-642. Jung, H., & Klein, C. M. (2006). Optimal inventory policies for profit maximizing EOQ models under various cost functions. European Journal of Operational Research, 174(2), 689-705. Khanra, S., & Chaudhuri, K. (2003). A note on an order-level inventory model for a deteriorating item with time-dependent quadratic demand. Computers & operations research, 30(12), 1901-1916. Kim, D., & Lee, W. J. (1998). Optimal joint pricing and lot sizing with fixed and variable capacity. European Journal of Operational Research, 109(1), 212-227. Kotb, K. A., & Fergany, H. A. (2011). Multi-item EOQ model with both demand-dependent unit cost and varying leading time via geometric programming. Applied Mathematics, 2(5), 551-555. Lee, J. S., & Park, K. S. (1991). Joint determination of production cycle and inspection intervals in a deteriorating production system. Journal of the operational Research Society, 775-783. Lee, W. J. (1993a). Determining Order Quantity and Selling Price by Geometric Programming: Optimal Solution, Bounds, and Sensitivity. Decision Sciences, 24(1), 76-87. Lee, W. J. (1993b). Optimal order quantities and prices with storage space and inventory investment limitations. Computers & Industrial Engineering, 26(3), 481-488. Lee, W. J., & Kim, D. (1993). Optimal and heuristic decision strategies for integrated production and marketing planning. Decision Sciences, 24(6), 1203-1214. Lin, C.-S. (1999). Integrated production-inventory models with imperfect production processes and a limited capacity for raw materials. Mathematical and Computer Modelling, 29(2), 81-89. Liu, J. J., & Yang, P. (1996). Optimal lot-sizing in an imperfect production system with homogeneous reworkable jobs. European Journal of Operational Research, 91(3), 517-527. Mandal, N. K., Roy, T. K., & Maiti, M. (2006). Inventory model of deteriorated items with a constraint: a geometric programming approach. European Journal of Operational Research, 173(1), 199-210. Panda, D., & Maiti, M. (2009). Multi-item inventory models with price dependent demand under flexibility and reliability consideration and imprecise space constraint: A geometric programming approach. Mathematical and Computer Modelling, 49(9), 1733-1749. Rosenblatt, M. J., & Lee, H. L. (1986). Economic production cycles with imperfect production processes. IIE transactions, 18(1), 48-55. Sadjadi, S. J., Aryanezhad, M.-B., & Jabbarzadeh, A. (2009). An integrated pricing and lot sizing model with reliability consideration. Paper presented at the Computers & Industrial Engineering, 2009. CIE 2009. International Conference on. Sadjadi, S. J., Oroujee, M., & Aryanezhad, M. B. (2005). Optimal production and marketing planning. Computational Optimization and Applications, 30(2), 195-203. Salameh, M., & Jaber, M. (2000). Economic production quantity model for items with imperfect quality. International Journal of Production Economics, 64(1), 59-64. Sana, S., Goyal, S., & Chaudhuri, K. (2004). A production–inventory model for a deteriorating item with trended demand and shortages. European Journal of Operational Research, 157(2), 357-371. Sana, S. S., & Chaudhuri, K. (2008). A deterministic EOQ model with delays in payments and price-discount offers. European Journal of Operational Research, 184(2), 509-533. Subramanyam, E. S., & Kumaraswamy, S. (1981). EOQ formula under varying marketing policies and conditions. AIIE Transactions, 13(4), 312-314. You, P.-S. (2005). Inventory policy for products with price and time-dependent demands. Journal of the Operational Research Society, 56(7), 870-873. You, P.-S., & Hsieh, Y.-C. (2007). An EOQ model with stock and price sensitive demand. Mathematical and Computer Modelling, 45(7), 933-942. Yum, B. J., & Mcdowellj, E. d. (1987). Optimal inspection policies in a serial production system including scrap rework and repair: an MILP approach. International Journal of Production Research, 25(10), 1451-1464.